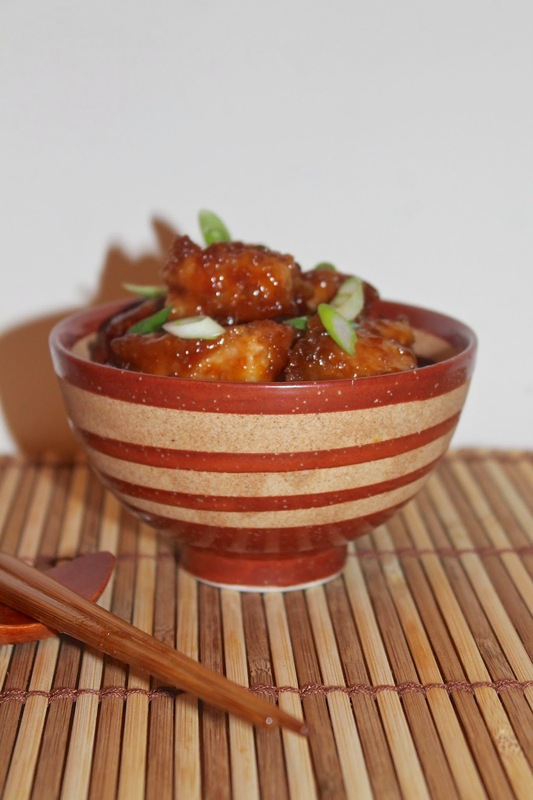 Orange chicken has always been one of my favorite Chinese restaurant take-out dishes and I've been trying to recreate it at home so that it's still delicious, but also a bit healthier. I know this dish is fried and full of sugar, so I've tried to cut down on both the sugar and the oil to make my version. The results? Still completely delicious and flavorful! It started with using this technique where you shallow fry the chicken and then bake it in the sauce. It still takes some time to make, but it was worth it to me. I'm going to try this method with other dishes in the future like Sweet and Sour Chicken and General Tso's Chicken. This recipe will serve about four people with a side of rice. I also served this dish with these Chinese kabocha squash & sesame pancakes as an appetizer while the chicken baked. 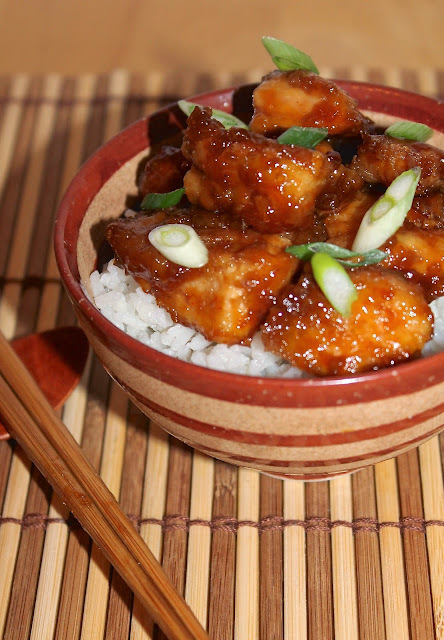 I think some stir-fried sesame green beans or carrots would also be a nice vegetable side dish to go with your Orange Chicken. I'm super excited because I've finally been able to keep a sourdough starter alive! I've tried a couple times in the past with no luck, but now I've had mine going for a couple of months now and it's doing great. I got this free starter after a couple failed attempts at making a wild one. I'm practicing my bread baking skills and looking forward to trying all sorts of sourdough creations. Given my love of pancakes, I knew it wouldn't be long before some sourdough ones hit my Sunday morning breakfast plate. And, boy oh boy are they delicious! The are a bit more savory with a slight tang from the sourdough - perfect for topping with real maple syrup, some butter, and berries. This is a perfect breakfast in my world. Plus, you start the batter the night before so all you have to do is add a few ingredients in the morning and they are ready to cook! 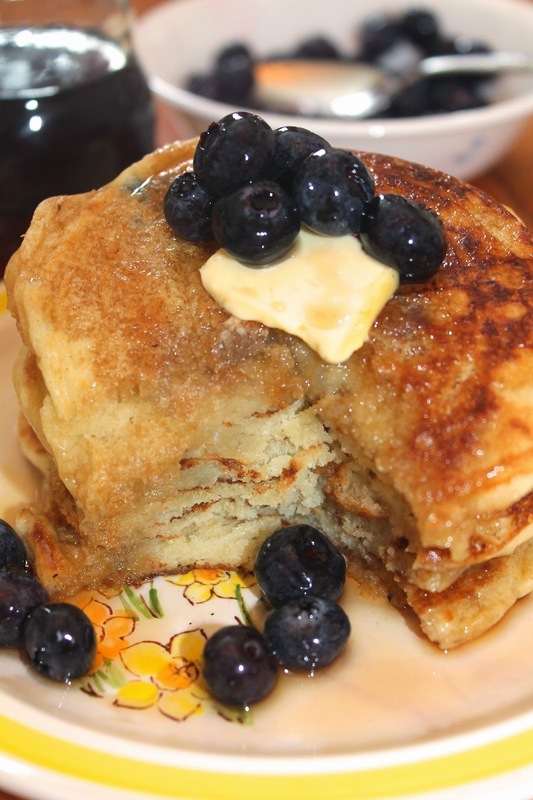 This recipe will make about 12-14 pancakes and it adapted from here. 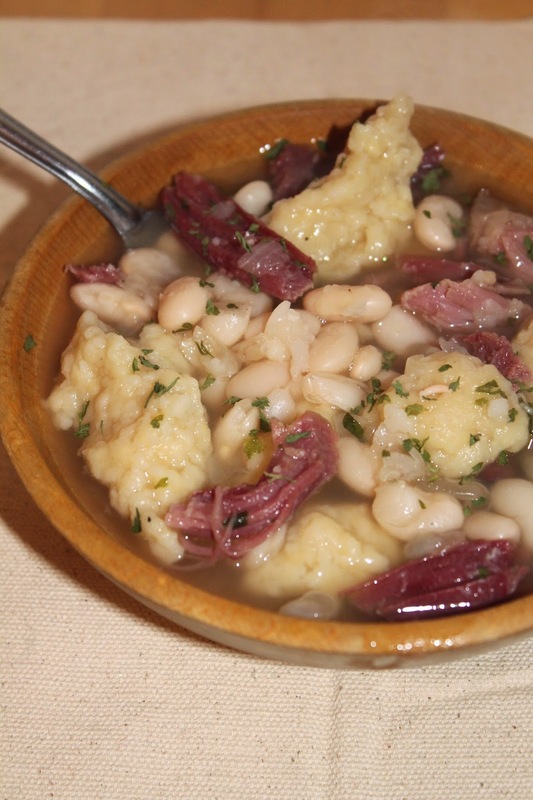 This is a soup that my mom used to make when I was a kid and it was always one of my favorites. It's a simple, humble, and frugal soup, but that doesn't mean it lacks in flavor and heartiness. The rivels were and remain my favorite part. What is a rivel you ask? It's basically a dumpling that comes from the Pennsylvania Dutch. If you look in their old cookbooks, you'll often find recipes for rivels and rivel soups (this Kindle one is free but I can't guarantee it contains rivels). This recipe is made from my memories and from a conversation with my mom asking her what she used to put in the soup. This a soup to make on a weekend when you have a ham bone leftover from a dinner (don't toss it). Make sure it still has some meat on it to use in the soup. It's perfect for a wintery Sunday afternoon and will make a large pot of soup. 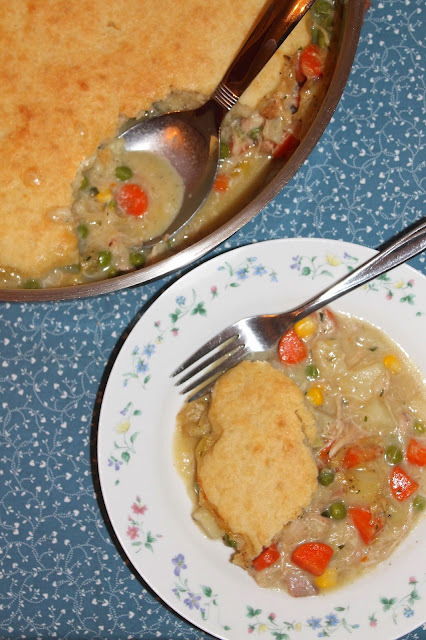 What's better on a snowy winter evening than a pot pie full of chicken, gravy, and lots of vegetables? How about one with a biscuit crust? Yes, it's awesome. Talk about comfort food! 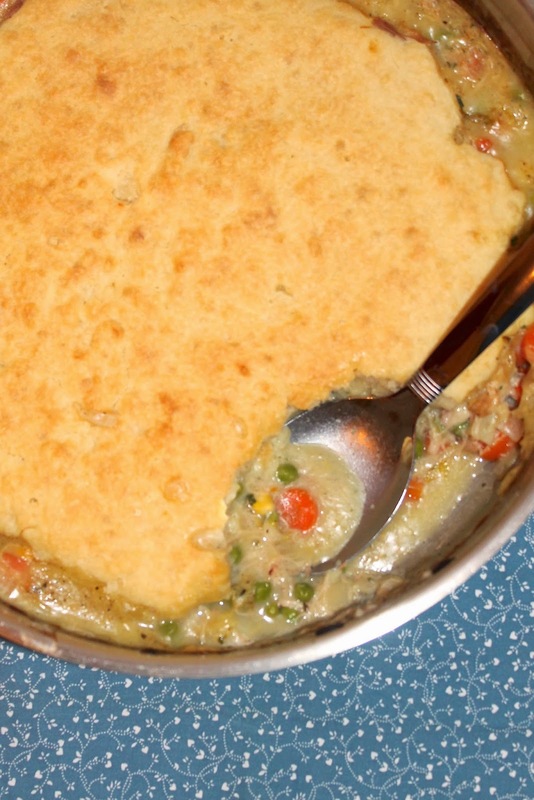 This pot pie is a delicious way to warm up and get a hearty meal after a long day playing outside. While I do love a pot pie in a regular crust, the leftovers tend to get soggy and I don't like that. Plus, I love biscuits. I mean, who doesn't, right? But to have a buttery biscuit layer that is firm on the top and fluffy and soft underneath is a special addition to any pot pie. While not a traditional "pie" in terms of crust, this dish is pie #2 of 25 Pies in 2015. The filling is my own, but I used this recipe for the biscuit topping. And speaking of the filling, don't feel limited here - you can swap in and out your preferred vegetables or even change it to turkey. I used carrots, potato, peas, and sweet corn - but you can use green beans, parsnips, turnips, whatever vegetables you enjoy! This recipe will feed about four people. This is a drink to have by your side while you are curled up with a book and a blanket on a cold winter day. 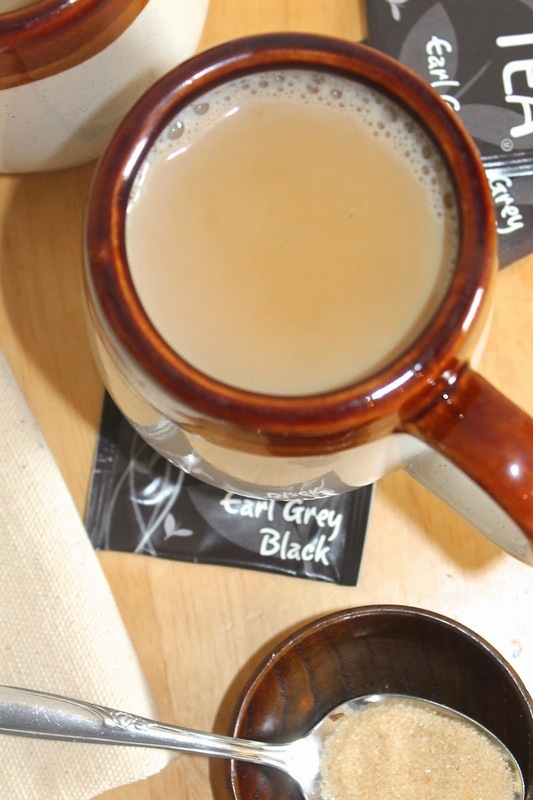 Earl Grey is one of my personal favorites teas, but adding vanilla, sugar, and some frothy milk make it an extra-special drink. It's been pretty snowy and very cold lately, so there have been a lot of hot beverages in our hands. Speaking of books, I just finished reading A Table by the Window on the recommendation of The Pajama Chef and really enjoyed it. I'll likely read the next installment soon, but am also looking for any other book recommendations - especially those that have stories that are set amongst food. Please feel free to leave your favorite food related books in the comments! I do read a lot, but have had trouble locating books I really love lately. So any recommendations are appreciated! 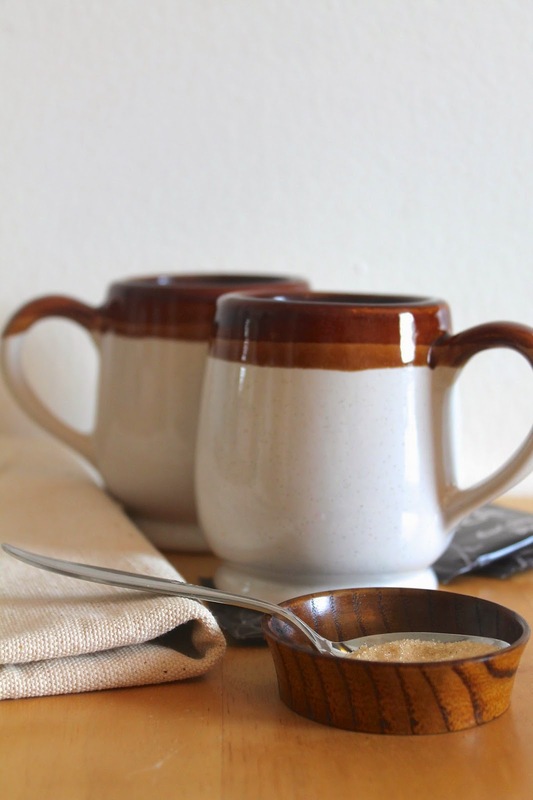 This recipe will make two servings of tea - perfect for you and your loved one when you need to warm up and relax this winter.